FREE Pianist e-newsletter - packed with how to play advice! 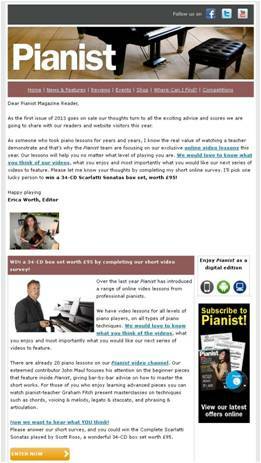 Thousands of enthusiastic pianists like you benefit from our popular e-newsletter, which features our latest how-to play piano video news, expert advice from professional pianists about how you can improve your playing, news, events, competitions and exclusive content. Sign up to the FREE Pianist e-newsletter today and receive a FREE Chopin score (Waltz op 70 no 2). The three waltzes from op 70 were composed between 1829 and 1841. This piece in A flat is extremely tender and inspiring and can be yours free of charge when you sign up for the informative Pianist enewsletter. Read our recently mailed e-newsletter here - the Pianist preview e-newsletter will open in a new window. Sign up to the FREE Pianist e-newsletter today It's simple to do and completely free!